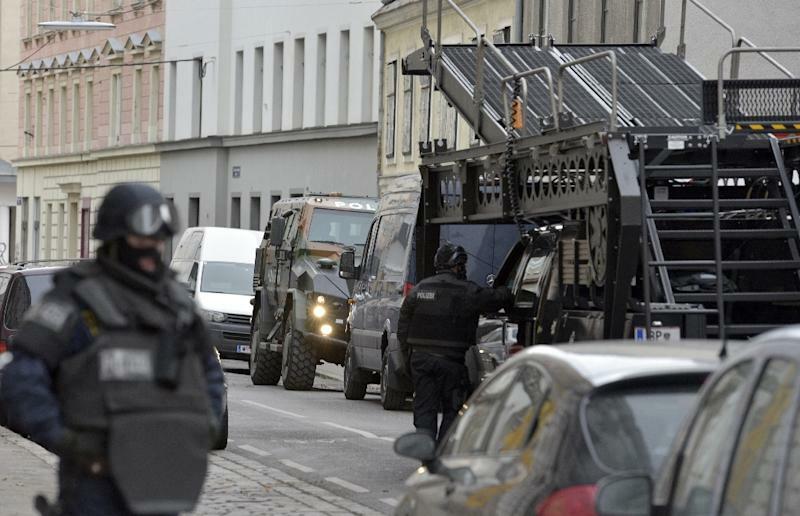 Vienna (AFP) - Austrian police raided several addresses early Saturday as they grilled a suspected Islamic extremist thought to have been planning an attack, authorities said. "There were several raids on homes in Vienna and Lower Austria (state)," interior ministry spokesman Karl-Heinz Grundboeck told AFP. "Material recovered in these searches is now being evaluated... So far there has only been one arrest, the one which took place yesterday (Friday)," he said. The 18-year-old man arrested on Friday evening in Vienna was meanwhile being questioned, Konrad Kogler, national security chief, said on public radio. "It is possible more raids and arrests will take place, depending on what comes out of the enquiry," Kogler said. Austria's interior minister had said Friday that the man was an Austrian citizen from the Albanian minority and that indications of possible links to Islamic extremists were being investigated. Wolfgang Sobotka added there were "leads suggesting that he may not be alone but that a larger network could be behind him". A police spokeswoman had told AFP that signs had multiplied in "recent days" that there might be an attack in Vienna, a city popular with foreign tourists, and that security measures were boosted. Kogler said Saturday that an attack on Vienna's metro system was "one possible scenario" and that there were indications that it would have taken place "in a very short space of time". Authorities declined to comment if any explosives were found. Police were on high alert with additional officers on duty. The public were told to be vigilant. Austria has been spared in the string of attacks by Islamist extremists in recent years suffered by other European countries. In 2015 a record 90,000 people applied for asylum in Austria after hundreds of thousands of migrants transited the country bound for Germany and elsewhere. Several of the attackers behind the deadly November 2015 attacks in Paris transited through Austria with false papers among the flow of migrants. In December 2015, two migrants were arrested in Salzburg and later extradited to France over their alleged intent to take part in those attacks, which left 130 people dead. A Moroccan asylum-seeker was detained in Austria in December for allegedly planning an attack in Salzburg over the Christmas and New Year period, prosecutors said. "Today's case shows once again that Austria is no blessed isle. That Austria, like Europe, has to expect terror situations," Sobotka said on Friday. Austria's opposition far-right has risen in popularity by stoking concerns about immigrants and security, mirroring the rise of other anti-immigration parties in Europe. It came close in December to winning Austria's largely ceremonial but coveted presidency and is leading national opinion polls.